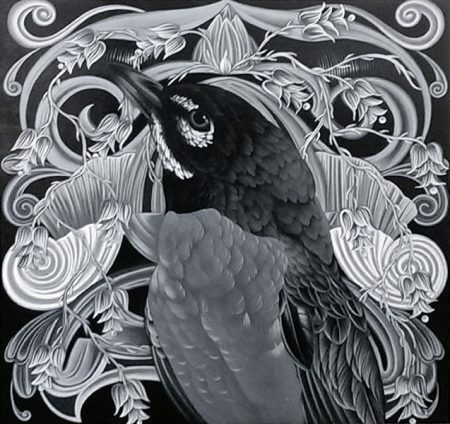 The birds in Kevin Veara’s paintings are vividly alive in their stylized natural world. 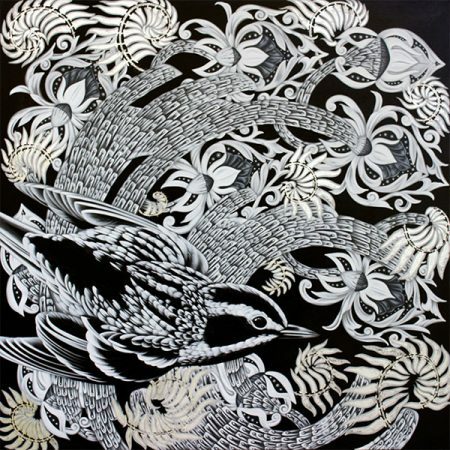 Birds of Paradise, an exhibition of a dozen or so of the artist’s recent works at Marta Hewett Gallery, Cincinnati, is on view in an area far from the door, almost as though these handsome creatures might fly right out if given the opportunity. 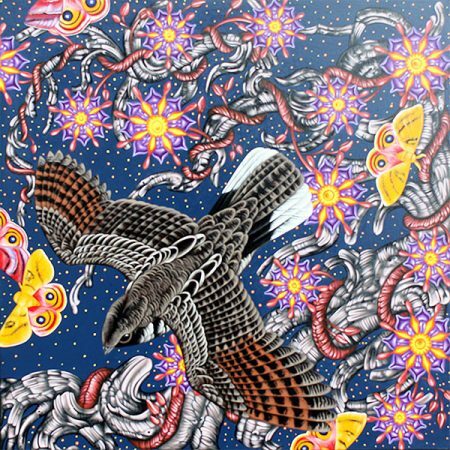 In Veara’s paintings the birds occupy their own world, which is Veara’s version of what he sees from his studio windows and out and about in the surrounding forested banks and flood plains of the Sangamon River Valley, near Springfield, Illinois. Strategically placed bird feeders provide year-round and seasonal visitor bird life with reason to congregate within his view, as his studio and house are deep among the trees. These are specific breeds of birds; they can be looked up in your pocket bird book, but in Veara’s paintings each seems more individual than prototype. He is as close an observer of plant life as bird life and his backgrounds are dense with foliage. This flower-filled world has no depth of vision; it is deliberately distilled to formal design but retains individuality and is noted in some of the titles. “Fanciful Bluebell” is with the American robin; “New England Aster” with Io moth. In at least one work and possibly more flowers have become something like miniature star bursts. The sharply horizontal “Passenger Pigeon” includes a side view of flowers which almost seem to be pointing the way for that now extinct species. Birds and flowers are not alone here, however. Butterflies,moths and caterpillars also occupy this live and pulsing world. Each has reason for inclusion because it relates in some fashion to the bird in question. Veara likes a square format, but occasionally stretches into a horizontal more than twice as wide as it is high, a shape that makes this viewer, at any rate, think of birds’ horizontal flight patterns. In the exhibition a couple of pieces are vertical but they are exceptions. Each of these works shows a particular variety of warbler, its yellow head vital to the composition. Thick, gesso-prepared wooden panels are the base for Veara’s paintings, a solid ground that stands out from the wall and calls for attention. Initial drawings on tracing paper are transferred to the panels and completed there. It’s interesting to note that the artist is a professional tattooist, a line of work that has its own influence on his paintings. In the midst of all this color, I found myself looking closely at the two black, gray and white works. “Exult #6 Warbler” (acrylic with silver leaf) has an extremely formal background, as does “Americana #11 American Robin” (acrylic). Both are square, 30 inches by 30 inches. Although lack of color puts the subject another dimension away from reality, each of these – especially the robin – has a decided sense of life. It’s something to do with the way he portrays the eyes. Both birds are seen in profile, Veara’s frequent choice of viewpoint, but the single eye of each seems to be watching. The works on view come from two series by this artist, one tagged as Exult and the other Americana. Veara is a dedicated observer of nature and is clearly knowing about what he sees. He is a native of the area in which he lives and works. His paintings, he hopes, raise consciousness of environmental concerns and recognition of the complications of climate change, invasive species and genetic modification. These weighty and important aims do not detract from the pleasure of this engaging exhibition, its subjects meticulously observed and carefully portrayed but never stifled. 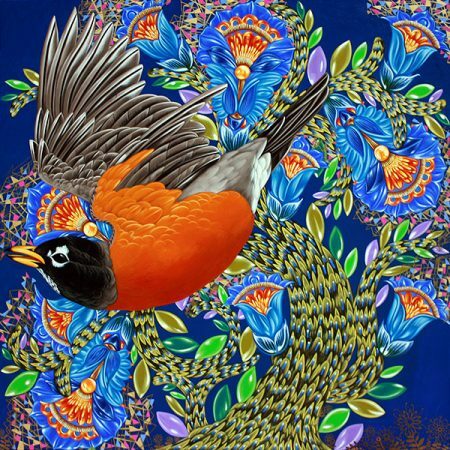 In notes made while looking at the show I wrote, of the painting of a robin and a bluebell, “a swirl of pleasure.” That’s not necessarily art criticism but does point up why we like art in our lives.